With Contact Center, Contrast tried to adapt some parts of Launch Center Pro to a subset of its functionality – getting in touch with other people – for a simplified, friendlier utility. It's with Group Text+ and Email+, however, that I feel like David Barnard and his team have hit a sweet spot of successfully abstracting features from their flagship app and reimagining them for a fresh, cohesive experience. 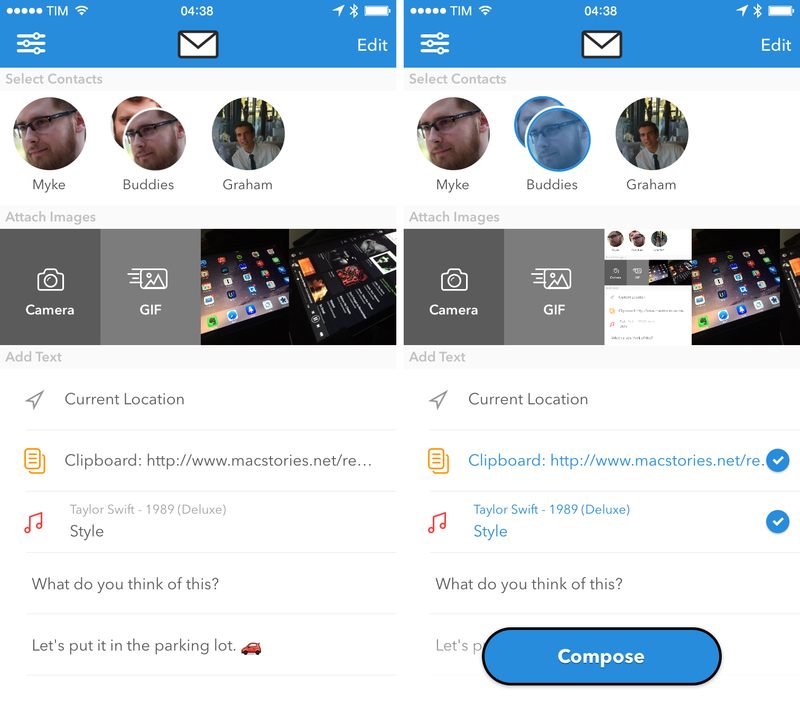 Released today on the App Store, both apps allow you to message or email individuals and groups of contacts, respectively, by tapping on profile pictures. Group Text+ and Email+ are two separate apps, but they share the same design: contacts are displayed at the top; images in the middle; text shortcuts at the bottom. The apps are easy to understand visually and they offer large, comfortable touch targets, which are handy when trying to find contacts fast. Unlike Launch Center Pro, Group Text+ and Email+ don't let you customize actions, set up chains of multiple apps, or use URL schemes to automate how you text or email people. In their ongoing quest to “unbundle” automated shortcuts from Launch Center Pro, Contrast selected features they deemed important and rebuilt contact shortcuts with a simpler flow and less personalization. The apps have fewer buttons and a scrollable preview of your photo library; there is no Action Composer because URL schemes are completely hidden under the hood. And that's not to say that Group Text+ and Email+ are dumbed-down versions of Launch Center Pro – in fact, after trying both for a while, I prefer them to similar functionality offered in Launch Center Pro as well as Apple's own Messages and Mail share sheets. 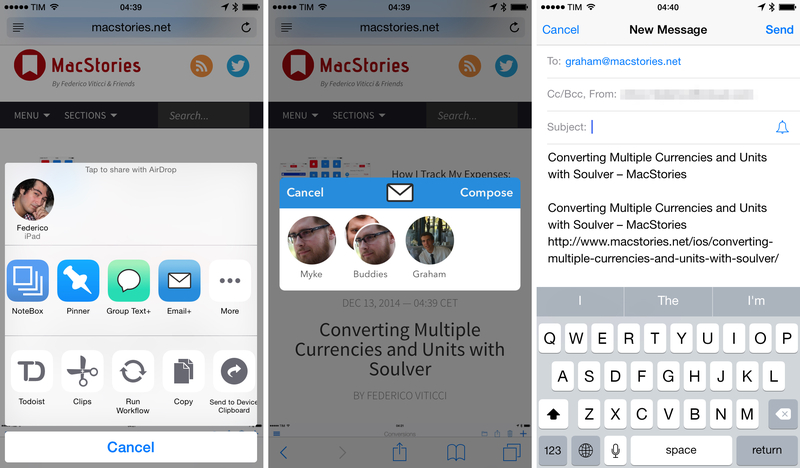 You can use Group Text+ and Email+ as standalone utilities or share extensions. In the main app, you can pick images, but also take a new picture or choose a GIF from Giphy like you can in Launch Center Pro (you can even bookmark your favorite GIFs). 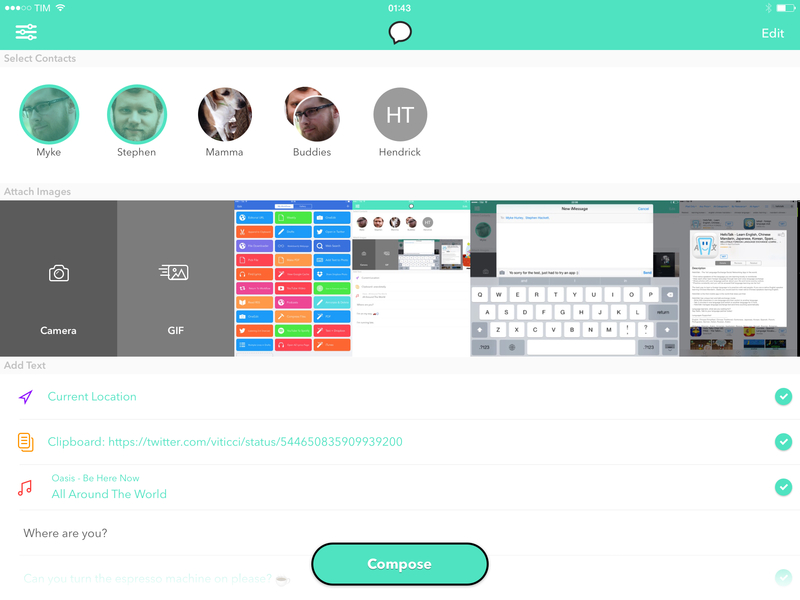 At the bottom, you'll be able to tap shortcuts to insert your location, contents of the clipboard, currently playing song, and canned messages that you can customize. Both apps have a vertical flow: you pick contacts (you can mix and match individual contacts and groups in a single thread, too), then you choose what to include in a message or email with more quick taps. What's great is that you can also combine multiple shortcuts together: just like different contacts can be selected at the same time, you can decide to send your location and a photo, or multiple photos at once, a GIF, and perhaps a pre-composed message as well. There are no keyboard prompts or other variables: once you're done selecting, just hit Compose and the app will bring up the native Messages or Mail sharing panels. 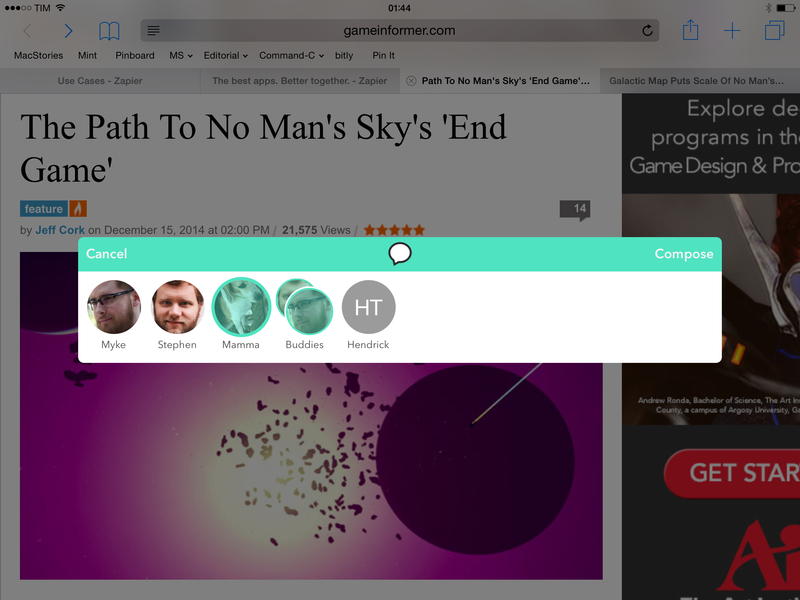 The Group Text+ extension in Safari. The ability to use contact shortcuts for individuals and groups carries over to the share extension, which loses text and image shortcuts in favor of integration with any app that can share content on iOS 8. When you activate the extension, you'll be shown contacts in a small floating panel: choose recipients, and the Messages/Mail sharing panel will be pre-filled with information shared by the extension. What's convenient about this implementation is that Contrast's extensions let you set up contact shortcuts for Mail and iMessage that you can easily tap. In Apple's default extensions, you always have to type the name of a recipient, which isn't as fast as tapping profile pictures of your friends and loved ones. Extensions have allowed Contrast to enhance the experience of composing messages and emails with a visual contact picker, which can save you time if you're constantly sharing links or photos with the same people and groups. I would have liked to see the same clipboard/location/canned text options of the main in the extension as well. Right now, the extension is limited to input passed by the share sheet, which is fine, but it could have been even more useful with the same shortcuts available in the app. Similarly, I'd like the extension to be capable of sending selected text from Safari (not just the webpage title and link). Personally, I won't use Group Text+ and Email+ for groups because all my group messaging has moved to Slack and I don't send group emails often. However, I like both apps to share content to individual contacts because they're faster than the standard Apple extensions and they let me share links and screenshots with my friends without typing their names; Email+ is especially useful to send emails to services that don't have native iOS extensions (like IFTTT and Zapier) but that support receiving content via email. Group Text+ and Email+ feel like an obvious evolution of Launch Center Pro's messaging features for the masses and not a “lite” version with limitations and design compromises. The extension needs to borrow more from the app, but this is a good start. Group Text+ is available on the App Store at $1.99 for a limited time; Email+ is available at $2.99.